George Spencer (1739-1817) succeeded his father to become 4th Duke of Marlborough in 1758. In 1762 he was made Lord Chamberlain, and a year later Lord Privy Seal. He lived at Blenheim Palace. Before he become a miniaturist, Gervase Spencer was employed as a gentleman's servant. He became a successful miniature painter on the newly fashionable base of ivory and later also produced work in enamel. Continental artists first introduced enamel painting to England in the 17th century. But it was in the early 18th century that it became fashionable. The young German Christian Friedrich Zincke dominated the market in London. It was Zincke who trained a number of English artists, including William Prewett. Most artists working in enamel were taught by an experienced enameller. It is not known who trained Gervase Spencer this difficult art, but he later taught Henry Spicer, who in turn taught William Birch. In 1794 Birch successfully established himself in America as an enamel painter. Oval miniature bust length portrait of George Spencer, 4th Duke of Marlborough shown with powdered hair wearing a red and blue uniform. 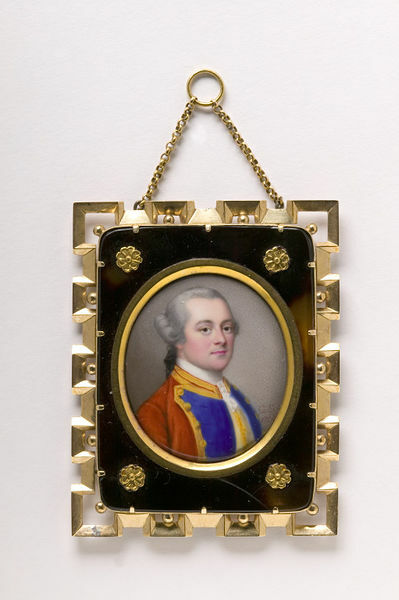 The miniature is enamel on copper and the original oval frame of gilt-brass with a gold front is set in a later rectangular tortoiseshell and copper, gold and silver alloy frame. Provenance: Reverend Hawkins Collection. D.S. Lavender, 1980. 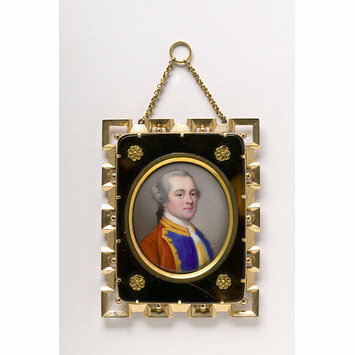 Enamel miniature on copper of George Spencer, 4th Duke of Marlborough, in a gilt-brass and copper, gold and silver alloy tortoiseshell frames, England, 1756, by Gervase Spencer. Coffin, Sarah and Bodo Hofstetter. Portrait Miniatures in Enamel. London: Philip Wilson Publishers Ltd. in association with the Gilbert Collection, 2000. 168 p., ill. Cat. no. 52, p. 103. ISBN 0856675334.